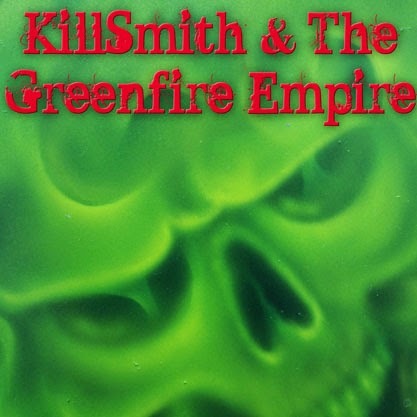 JP's Music Blog: CD Review: Neal Smith Tells The Story Of A Drug Lord With "KillSmith & The Greenfire Empire"
CD Review: Neal Smith Tells The Story Of A Drug Lord With "KillSmith & The Greenfire Empire"
Former Alice Cooper drummer Neil Smith recently released his third solo album "KillSmith & The Greenfire Empire." Smith explains that this album tells the story of a poor boy growing up in the jungles of South America, who eventually becomes the biggest drug lord of the world. The new eleven song release starts out with the hard rock feel of "Blessings And Curses" as Smith takes the lead vocals. as his gravely voice adds to the authenticity of this classic heavy sound. Singer Hubert Martin takes the lead on the upbeat "Good Morning In Blues Soul Land," which sounds out of place when followed by stomping drums and violent storied lyrics of "Screaming Bloody Murder." The mostly instrumental "The Killsmith Overture" combines classic hard rock with a little Latin flair. This song should have began the album as it sets the tone for the storied concept of the album perfectly. The album's first single "Greenfire Born Of Poison" has a great hard rocking, classic metal sound as Smith's exceptional drumming and the dual guitar attack of Doug Wahlbert and Kevin Franklin lead the way. Vocalist Lady Elizabeth Dellinger lends her vocals to the introduction of "I Want Money," which sounds the most like the classic Alice Cooper Band days. The album (and story) finish up with the steady, arena rocker "Death To The King" and the power ballad feel of "Noelle No Wonder," which features bassist Peter Catucci on lead vocals. To find out more about Neal Smith and his latest release "KillSmith & The Greenfire Empire," please visit nealsmithrocks.com.